Thanks to those who commented on my poster designs. This is what I went with in the end, and I was rather chuffed with it! I had a bit of bother getting it printed this week. 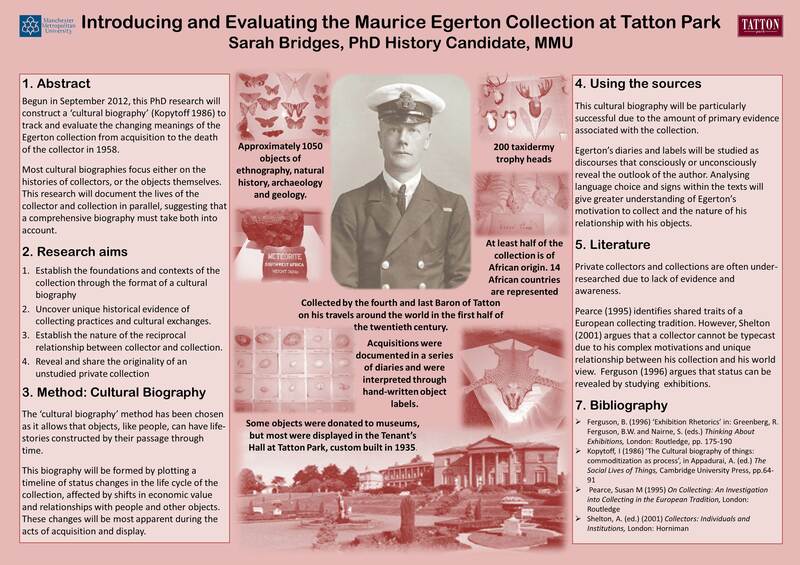 The research institute offered to print our posters for us, but when I went to pick it up it looked terrible- the pictures had moved and were hiding the text and a random text box had appeared out of nowhere. The institute had changed it from powerpoint to PDF to print it and something obviously went wrong in translation. So I did a quick fix and luckily poster 2 printed well. The symposium was today, and I got in nice and early to pin up my poster. In the breaks I had to stand by it and talk about it to the students and staff that stopped by. I was quite nervous at first but I had a great time talking about my work. I was so pleased that so many people came to see me and were interested in my work. I’m really lucky that my topic naturally seems to attract people’s interest. Although I hope that my love of the collection comes through as well! I do enjoy introducing people to Maurice. It was also nice meeting up with other students and hearing about their work. I love the randomness of the range of research topics. Some of the papers today included ‘Queer reading of Bronte’s Wuthering Heights’, ‘Telephones in Sri Lanka’ and ‘Tolkien’s Farmer Giles of Ham’. 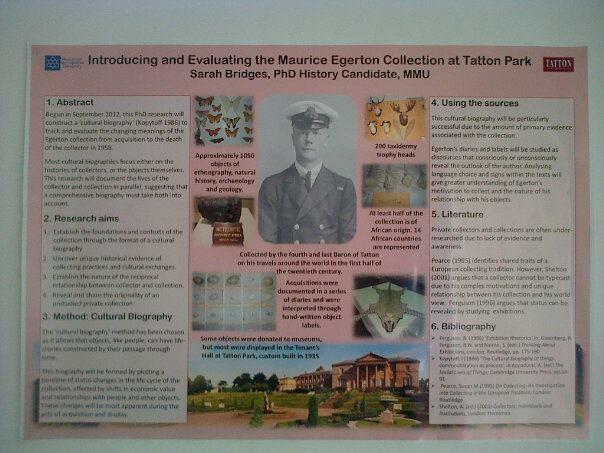 Best of all, at the end of the day I found out that I had won ‘best poster’ and I got a nice blackwells book voucher. After so much academic reading this year I might be naughty and treat myself to some fiction books. 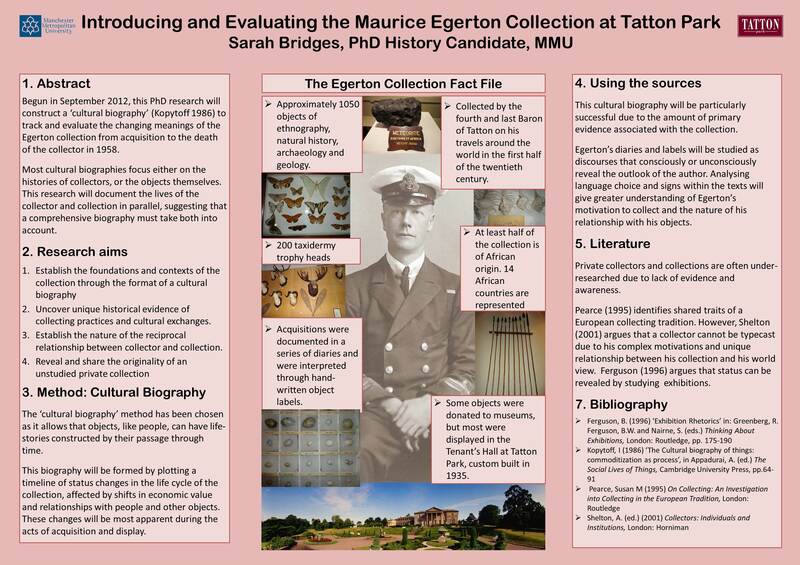 I’m presenting a poster at the student conference at MMU on Friday. This means I have to stand by my poster and explain my research to anyone who stops to talk. But my poster should also speak for itself when I’m not there. So it needs to be easy to read, and visually appealing to draw people in. Somehow I have ended up with two posters and I’m not sure which one to go with. Any comments on preferences will be gratefully received before I go to print.